It’s here! It’s been a full season! So today’s question is, how big is your heart? Has your heart grown bigger this season by loving all, spending less, giving more and worshiping fully? How can you keep this spirit going into the new year? We praise Your holy name. Amen and Amen! The definition of re-gifting is to take something you have been given and wrap it up and give it to someone else. Have you ever re-gifted something? What do you have that is worth re-gifting? as shepherds to the stable after hearing angels sing. not embarrassed to express itself in praise to our heavenly King. My name is Malia, and I have been blessed by a life-long relationship with the Christ-St. Paul’s family. I am a teacher. It is my daily frame of reference. Not surprisingly, many of my perspectives are through the lens of teaching. Today’s reflection will again be through my teacher’s lens. Teaching has never been my job or career. It is my life’s work. God’s word in 1 Corinthians tells us, “But each of you has your own gift from God; one has this gift, another has that”. My gift is for teaching. People who knew me in my childhood say they could see it early on in my natural, easy way with children and my love for “playing school” with friends or even by myself in my room. I have strived to use that gift in a way that fulfills God’s purpose for my life and pass it on to others. My students and I wrote goals for this school year in the first few days of school. My goals were to love my students unconditionally, provide support and positivity for my colleagues, and help students achieve their potential. I asked students to also write goals, and we shared those goals with others through a display on our door. We are reminded of those goals as we enter and exit each day, and anyone who comes to visit us can see how important those goals are to us. Many people stop to look and read, and many of my colleagues, in turn, chose to do a similar activity with their students. In James 1:17, we read, “Every good and perfect gift is from above, coming down from the Father…”. So, what are the gifts we have received from above, and how can we, in turn, regift or share them with others? We have received the gift of salvation, the gift of eternal life, the gift of the Holy Spirit, and the ultimate (re)gift, the gift of grace, entirely undeserved and un-earnable. Some things that I have that are worth regifting? Certainly. But how can we regift these to others? Sometimes I struggle with that. The world doesn’t make it easy. Every day it feels like the world is making it harder and harder to share these gifts with others. I admit that I don’t always feel welcome or even comfortable openly sharing my faith in certain situations. There have been times when I could feel the joy of these gifts welling up in my heart about to burst out, but I didn’t regift them out of fear of offending someone or appearing “unprofessional”. As I did some reading this week, my heart was pierced by this verse in Acts 11:17, “So if God gave them the same gift he gave us who believed in the Lord Jesus Christ, who was I to think that I could stand in God’s way?” Ouch. So, this Advent season, I am working on giving more of the gifts from God that cost me nothing. I am working on loving all, even the folks who get offended when I regift my faith, and worshipping fully offering all parts of myself, those that come naturally and those with which I still struggle. Perhaps the struggle is a gift worth regifting, too. What do you know about Mary? What was she like? That we, like Mary, might be Your willing servants. Amen. My name is Cameron and I’ve been at Christ St. Paul’s for 26 of my 30 years on Earth. What do I know about Mary? And what was she like? I very much imagine Mary like so many others must also imagine her. You always see her as a very young woman with long, dark brown hair, dressed in some sort of blue garments of her time period, and holding a baby wrapped in various white cloths. I know she was a virgin to be married to Joseph when the Angel of the Lord came to her to tell her she was with child. And I cannot begin to imagine the fear in this poor, young woman, who has just been told she is pregnant, but has no idea how this fact can be, since she is not yet married and is indeed a virgin! As if it’s not scary enough for an Angel to appear to you, this messenger of God himself is here telling you that out of all the people in this world, YOU have been chosen to carry and give birth to God’s only son, Jesus. I think about Mary, and I think about how willing she was to serve the Lord, even though she must have had a million questions. I think about her faithfulness in God and her obedience to his will, even if that meant having to change every plan she had made for her future. I’m sure Mary, just like any other engaged woman, had wedding plans, had an idea about starting a family, had thoughts about just how her life was going to go, and here comes God, changing up everything. I most certainly wouldn’t be a willing and obedient servant to God, such as Mary was. I would definitely not have faith in God’s plan and not have trust that it would all work out in the end. I can only imagine my selfish pride and stubborn preoccupation with my own life plans would get in the way of my humility towards God and my willingness to serve Him. And so I can only sit here and pray to the Lord that He “teaches me obedience, grants me forgiveness, so that I may, like Mary, be His willing servant.” I can only repent to God for my sin as a stubborn and selfish woman, and pray that he instills in me a greater willingness to act as He commands and wishes me to do. I can only strive to do better, to pause in my busy life, to put my own agenda to the side for just a minute, and to really listen to what God is saying to me and asking of me, as His willing and obedient, faithful servant. What do you know about Joseph? What was he like? I’ve got to be honest. Despite growing up in the church my entire life, despite reading the Bible and learning The Lord’s Prayer with my father at a very young age, I am not very proficient in my Bible knowledge. Even though I know most of the Sunday morning prayers and a lot of the worship songs by heart, I by no means consider myself an expert Christian. So what do I know about Joseph? Well, not a whole lot. I know he was to marry Mary, and she miraculously became pregnant, and he decided to marry her anyways and “divorce her quietly.” I know he was Jesus’ father, and he must have done a real good job at it, because look how Jesus turned out! When I really think about Joseph, and when I read this passage and think about what he really faced, I think what a genuinely good man he was. I mean here he was engaged to be married to this woman and she gets pregnant. And instead of just embarrassing her as an adulterer in front of everyone and leaving her all alone, he decides to support this woman anyway, at least for a little while. And then he is visited by this Angel, which probably scared him half to death, and this Angel tells him he’s going to have a son with Mary, of which is actually impossible, but he just goes with the flow. He trusts in his faith and remains obedient to the Lord - he takes Mary as his wife, and he takes Jesus as his son, and he becomes the model husband and father. And then I think to myself: What if, when God called Joseph to “play his part” in his plan, he had said “NO”? What if he hadn’t been faithful, courageous, and obedient? What if he just hadn’t been “ready to listen”? But for whatever reason, God was putting it on my heart to begin writing again (I hadn’t written since high school, but I was actually pretty good at it). And so I took a leap of faith, I obeyed God’s calling, I sat down at my laptop, I put my feelings into words on a page, and I published it. But then the responses began pouring in. The overwhelming support and positive reactions from my readers, even affirmations from some that my words sort of changed their lives, assured me that having faith and trusting in God’s calling for me to write had been the right thing to do. Just like Joseph must have felt later in life, as Mary’s husband and Jesus’s father, I was so glad that I had been “ready to listen” to God’s calling. I was happy that I had not only been obedient to His whisper but also courageous in my mission. Much like the devout Joseph. And so I find myself again trusting in my faith, and trusting that God is not sending me on a wild goose chase. Because I’m just not busy enough, God has yet again asked me to “step out into the unknown” and begin leading my own Home Group here at Christ St. Paul’s. Why he has commanded me to do such a thing, so far, I do not know. But I definitely feel the calling. I ignored it for months, and I hoped that it was a calling that would eventually just go away. But y’all know God - he just keeps on “whispering into our small corner” until we finally have to break down and just listen to him already! There will come a day when His purpose for my leadership of this group will be revealed to me. Until then, I will just continue to do what I can to “fulfill his plan,” just as Joseph did over 2000 years ago. What’s your favorite movie? How many times have you seen it? Does seeing over and over again make it less interesting? What happens when you hear the Christmas story over and over again? Do you know it so well that you forget to pay attention? Hello! I'm Scott Elingburg and I’ve been a member of CSP for a few years now. I ready today’s devotion and thought, “This should be easy.” It was anything but! I do, however, love watching Christmas-themed movies, especially at Christmas time. Christmas Vacation with Chevy Chase, White Christmas with Bing Crosby, Die Hard (the best Christmas movie ever, in my opinion). All of these bring a kind of comfort in their repeatability and their familiarity. I know what to expect, when to expect it, and I don’t expect anything more or less. It’s a sharp contrast to Christmas, a season built on expectations. And, for the most part, we know what to expect. But that means we can forget that our expectations can disappoint us. Not that Christmas is a disappointment, but our expectations of Christmas end up making us feel… disappointed somehow. Today’s reading, Genesis, 1:1, I felt I didn’t need to read it because I knew it so well. I knew what to expect, in other words. But I re-read it: “In the beginning God created the heavens and the earth.” I’m taken aback by its stark, fierce simplicity and also by its enormous complexity. When I was an English teacher many years ago, I used to tell my students, “Pay attention to the details. There are worlds hidden within the details.” But even as I insisted that others follow this advice, I, too, am guilty of not following it. It’s much easier to pay attention to the “big” picture; the largest view set in front of us. It naturally draws our attention and also gives us a sense of comfort, a sense of focus. But typically the big picture swallows the details and then we’ve missed our chance to use our gifts—our minds, our senses—to truly see. In a way, the first sentence of the Bible is calls us to pay attention, but also to find the (literal, in this case) worlds within the written words. “God created the heavens and the earth”—think about all that encompasses. No, really. Think about what that means to have made and designed the patterns and intricacies of the earth. From the tiniest insect to the stratosphere. And the heavens? It’s nearly impossible to fathom. But we can start small and expand out from there. That’s what the details ask us to do: start small, look outward, find the worlds that are already there and appreciate their part. It makes the “big picture” come to life in ways we might have forgotten about. I'm Cindee and this reading one is really special to me as a women’s minister and Bible teacher. I have a real heart for racial reconciliation in particular within the church and our community. It was her shame that kept her behind doors as the other ladies of the community gathered to chat about the day’s events and to share local gossip. She knew her past. She heard their all too audible whispers. She couldn’t bear to stand up to their ridicule and judgmental glares once again. So, she waited until the heat of the noon day, when everyone else was busy indoors, to make her trip to the well to collect the water she needed to satisfy her daily needs. I imagine she knew, even as she walked in loneliness and silence, that others who were safely hidden behind walls were peering out at her. She also knew full well that she’d have to take this walk of shame tomorrow and the next day and many more days to come. The helplessness and hopelessness of her situation must have left an aching hollowness deep within her that was as empty as the jar she carried to the well to fill. I imagine that along with her physical thirst this Samaritan woman also carried a very real thirst for acceptance, love, and the kind words of a friend. Many of us know people who think they are not good enough, not religious enough, not married enough, not “regular “ enough, to approach God. Their brokenness and shame keep them from coming to the source of the living water they so desperately need. It is my prayer, as I reflect on today’s narrative, that I would greet such people as Jesus did and still does. He knew this woman inside and out and yet He freely offered her everything she needed and more than she could imagine. Likewise, He knows me and every shameful secret of my life and yet offers me forgiveness, healing, hope, and an eternal home with Him. It is my prayer that I would risk crossing social, racial, and cultural boundaries to bring the grace of Jesus to those like the Samaritan woman whom I encounter. May I seek out ways to share the living water through a lifestyle of worship and a willingness to be the Lord’s vessel. What kind of week had it been for Jesus? How was he feeling? What kind of week has it been for you? How are you feeling? Jesus sees that all of us labor and are heavy laden and are in need of rest or are in need of him or in need of peace. What gift can you seek from him today? My name is Malia. I'm a teacher. After twenty-five years in education, most of them in the classroom, I can tell you one universal truth about teachers: Teachers.Are.Tired. 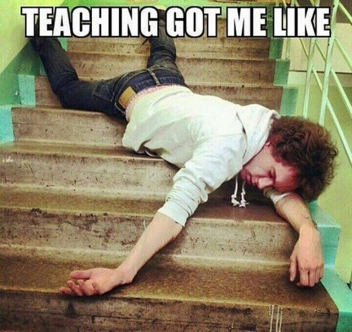 Truly, there is no tired that is quite like teacher-tired. I am certain you have seen the memes on Facebook, animated skeletons dragging themselves down school hallways or a comedian professing the often hilarious confessions of a tired teacher. The memes are never ending and poignantly true which is precisely what makes them funny. Because it sums up many of our teaching experiences in a single image or phrase, we instantly recognize ourselves and find humor in the absurd. If you don’t have any teachers in your circle of family, friends, or acquaintances, simply search Google images using the phrase “tired teacher” and you’ll have yourself a virtual field day with the images that greet you. I can tell you from personal experience that at one time or another I have been the teacher most of the memes are depicting. This is never more true than when we are approaching the holidays. By this point in the school year, many of have of us have succumbed to the rarified, germy air and are walking around with a tissue tucked under our sleeve or are on a round-the-clock cocktail of decongestants. Worn and weary? Definitely. And the wear is not just physical. It is mental, emotional, and spiritual. Jesus, God in the flesh, must have felt very tired as he traveled from Judea back to Galilee. In fact, the scripture amplifies the description of his journey with the words once more, “….and he went back once more to Galilee”. So, we know the journey was one that Jesus repeatedly made. John tells us his journey was a long one having to travel through Samaria and that he stopped at Jacob’s well to rest. Imagine all the needs and burdens of the multitude to which he and the disciples had been ministering, all seeking relief that only a messiah could give. Imagine the weight of that. In fact, there was so much work to do, the scripture tells us that the disciples were assisting. We are told that they were doing the baptizing, and that while Jesus rested, they went to get food. Surely, Jesus was exhausted and physically drained. We can all relate to that. Furthermore, in his exhaustion from the journey, Jesus can relate to us. Jesus can relate to me. Hold that thought. Let it sink in and say it out loud to yourself. Jesus can relate to me. This is powerful. God, through his son Jesus, fully experienced humanity. He knows what it is to be one of us, to be tired and worn by the world, and we, in turn, know that He understands our pain, our burdens, and how tired we are. This Advent season I seek to rest in his presence, to sit down beside him at the well, and wait to be replenished with him. I also seek to be in his present, to transcend time, to the let yesterday and tomorrow fall away and to fully occupy the present with him. I seek the gifts of calm and contentment and the kind of rest that not only refreshes and replenishes my physical, mental, and emotional self but secures my eternal rest from the burden of sin. How many people did you come in contact with today? My name is Madison, and I'm happy to come in contact with you today. I sit by myself and yet not alone in a coffee shop late in the afternoon. I am one mind, one world surrounded on all sides by others. The café bustles. Jazz and conversation in the background as I read today’s scripture. What hurt do these hearts carry? Do they know that the God of the universe places infinite value on their lives? The lives around me matter. Have I lost track of the lives of others in the midst of my own journey? Is my face so set on my own path that I forget to stop and love those around me? Then there are those closest to me. What about them? Am I living fully and loving deeply? My family, my friends, my church family, my mentors. How can I love them truly, intentionally? “You shall love your neighbor as yourself” (Matthew 22:39, ESV). If I am honest, I sway from either thinking too highly of myself to thinking too low of myself. Don’t we all live on this pendulum? So how are you and I to love others? Are we to drift here and there? No. May our love look like that of my Savior. One who stops everything to come close to us in our deepest depravity. His love is steadfast and pure. He does not abandon or reject. His love saves. His love is personal. Maybe loving others this Christmas looks like coffee with an old friend, listening to someone who is hurting, or laughing freely with new friends. Maybe loving others this Christmas means sharing your testimony—opening yourself up, taking off the mask—to share about Christ’s love in your own life. Maybe loving others this Christmas is found in the act of stopping. Stop pretending. Stop trying so hard. Stop isolating. Start loving. Start being loved. May you live in this love today. Yesterday was about favorite traditions. But what’s your least favorite Christmas tradition? Or, do you remember a Christmas that felt like a disaster? My name is Allan Skinner. I worship at CSP. Most of you probably don't know that for many years I have struggled to find joy during the Christmas (actually advent) season. It was a much bigger problem than I let on. I was filled with anxiety about who do I give gifts to? what do I get them? The traffic, the crowds, the expense! The whole thing just seemed like a big hassle. And to make matters worse, I felt guilty for feeling this way. I knew that Christmas isn't really about all that stuff but it got to me anyway. Every year, usually late Christmas eve or early Christmas morning, in a quiet moment I would finally be able say, "ahhhh, there it is! This is what it's supposed to be like." Then I would tell myself that next year will be different, but it would happen all over again. Last Christmas was the first since my wife, Terri, died. I doubt if anyone would have blamed me if I decided to just skip the whole thing. But the idea of the Advent Conspiracy and it's guiding principles got my attention and The Lord kept giving me ideas for unique gifts for the handful of people closest to me. They were simple and inexpensive. Some are things Terri and I had in our house for years. Each one uniquely special to the one who received it. I actually enjoyed preparing for Christmas morning! Best of all were the stockings filled with cheap, silly stuff. Filling the stockings is what Terri loved most. We laughed about how we could always count on getting pocket warmers and some kind of little flashlight amid the candy and nuts. And there was always an orange in the toe. So what could have been "THE WORST CHRISTMAS EVER!" turned out to be something beautiful and sweet that I will remember with fondness. How are your traditions special to you and your household? In those days, Caesar Augustus made a law. It required that a list be made of everyone in the whole Roman world. It was the first time a list was made of the people while Quirinius was governor of Syria. Everyone went to their own town to be listed. Today, let’s be different. You might remember the ancient form of poetry called Haiku. Simple words, three lines, 17 syllables in the form of 5-7-5. It simply frames moment in time. You pause, reflect on something, and put it into a few words. As a fun challenge today (and all week please!) write a Christmas haiku. Or, while waiting in line at the store, or in traffic, notice what’s going on around you and write a haiku about what you see. The challenge is set. It's all about stopping and being present in the present. Setting down the lists and the phone and seeing what's around you. Observing the ordinary. Interacting in the immediate. Take time for an Advent Conspiracy reboot. Make a plan to worship fully, give more, spend less, and love all this week. How can we not bring today our sacrifice of praise? Father God, prepare our hearts not only for the celebration to come, but also for sharing that Good News with friends, family and work colleagues should opportunity arise. Grant us courage and a real willingness to talk about the love that came down to earth and walked among us. Amen. As I read today's devotion, I thought about my family tree. In my family, my mother was an only child and my father had one brother. My grandfather had brought his family to El Paso from Canada with the railroad and by the time I came along, there was only my family and my aunt and uncle's family. There are 5 of us siblings and I have 5 cousins. By Yonges Island standards we were an extremely small family. As I reflect on my family tree today, I have my own three children, two lovely daughters-in-law, and four precious grandchildren. My siblings have several children and grandchildren, my cousins likewise have children and grandchildren. We're still pretty small compared to families here, but we've grown tremendously in my lifetime. I suspect the rector should obviously want to have Jesus in my family tree, and we already do! What a blessing it is to know that. But I suspect the question is looking for someone who is not already in my family tree. And then I begin to wonder why would I want someone, would it be because of something missing in my life? Would it be to have some gift or talent I wish I did have that they would obviously passed down to me? I know, I'm possibly evading the question, but honestly, as I reflect the only person or people I would want to add to my family are the people who i've come to know and love within the Church, the body of Christ. And here too, they already are my brothers and sisters. Think back to last year. What was going on in your life? How does this year feel different? Lord, how wrong I have been to act as if Christ had never been born. As if He didn’t perform miracles. As if He didn’t take my every tear, my daily worries, my sin and insecurities on that cross. As if the tomb wasn’t empty and the throne wasn’t full of His presence and grace. It’s that grace that gives meaning and power to Your promises. I know that Your Word prevails even when our world turns black. I trust that Your healing comes in different forms, stages and ways. I believe that You promised to provide all we need, seeking You doesn’t require physical vision, complete health or a life free of troubles. But instead, a heart full of devotion and obedience, which I offer You. I’m Lynn and I work and worship at CSP. Reading today’s devotion and thinking back to last year compared to this year just made me laugh. It is a joke around the office because last year, I was the only full time staff other than the priests and, most importantly, I was the youngest! We have been so blessed this year with the addition of two full time staff members, Andrew and Tapley, and somehow in the blink of an eye, I became the oldest –ugh. Working alongside two techno savvy, totally creative and energetic people can really make you feel like you have aged much more than a year. So in my world, a year can make a big difference!! On the more serious side, Andrew and Tapley are patient with me and give me grace in the office just like Christ does for every aspect of my life. I love the saying 'God loves me just the way I am but He loves me too much to leave me there.' During Advent I purposefully try to slow down to process my spiritual growth for the past year and try not to be disappointed when I haven’t traveled as far as I think I should have. *Lynn is talking about the CSP effort to 'Undecorate the Tree' beginning Sunday, 12/10. Read more in Fr. Craige's Advent notes from Monday 12/4. For Your faithful prophets and Your Living Word we give You thanks. Amen. My name is Doug Wheat. I'm a previous member and 'old' friend of CSP. While reading today’s devotion I was aware of a sensation that I experience only occasionally. That is to suddenly - and unexpectedly - see and experience the Lord in a completely new and different way. This happened for me today as I was reading the quote in the devotion: “God gives God. That is the gift God always ultimately gives. Because nothing is greater …”. It may seem obvious on the surface and yet, as I continue to think about it, the depth of these words and the impact it has on my thoughts increases. This is all the more startling (and joyful) to me because I consider myself to be a mature Christian, and yet, I can and do experience God and his gift Jesus Christ in new and different ways. I am guilty of 'boxing' the Lord into thoughts and terms that help me understand the depth and glory of the Lord. But the wonder of God’s Word for me is that, even after reading the same verses dozens of times, a new aspect of God’s character and His goodness, is revealed. I recently heard someone say that “Joy and hurrying are incompatible”. I’m still considering the full truth of that but the change of heart and mind this invokes in me is certainly true. That is, “to slow long enough to unwrap the greatest Gift with our time”. Throughout this day I intend to do just that. To slow enough to appreciate and think about that Gift. To allow the Lord to lead me along a different path and to see others and serve others as a reflection of that Gift. Most families have stories about getting lost while travelling. Most families have one member of the family who refuses to get directions or ask for help. Do you have a story like that? Lord, I know that a person doesn’t control their own life. My name is Bonnie Rackley, and Christ-St. Paul's has been my home for many years. This is my story about getting lost. Every week I make a five-hour round trip journey to Aiken, SC to visit my sister who has Parkinson’s disease. I make this trip to capture every minute of precious time we have left before the dementia that is wiping away her life memories completely erases me. Sometimes she knows I am her sister and sometimes she thinks I am her daughter. But that is okay. At least I am still somebody to her. I don’t mind the trip. In fact, traveling the backroads is a peaceful time for reflection. And the scenery is beautiful: farmer’s fields that are sometimes full of corn, or soy beans, or lately white acres of cotton. The woods are full of trees glowing green in the summer and shining red and orange and yellow in the fall. And for much of the journey, I am the only car on these deserted roads. I avoid the Interstate at all cost - too many trucks and Nascar driver wannabees. But one must know the way when traveling the backroads, as I found out the hard way. I should have followed the advice I always give my daughters: “Don’t rely on that GPS on your phone. Look at a map first and have some idea where you are headed.” But on my second 'back road' trip, I did exactly what I tell them not to do. I decided to try a different route, one that my GPS assured me was the shortest. So, I plugged my destination into the phone and took off, confident that if I turned down the wrong road, I would be instructed to “make a u-turn when possible” and be back on my merry way. This logic would have worked just fine if I had not lost my signal about 30 minutes into my trip. In trying to get back to the GPS, I completely lost my stored route and had no signal to access any maps or even make a phone call for that matter. I kept driving, certain I would recognize something from the one trip I had taken before, but as I encountered one unfamiliar intersection after another, I began to panic. And I got mad. I was angry at myself for not having a map, angry at AT&T because I had no signal, angry even at my sister for being so sick that I felt compelled to make these journeys. When the tears began to fall, I knew it was time to pull over and talk to God. I was somewhere in the woods between Hollywood and Aiken and I hadn’t seen a store or gas station for miles. So, I pulled over into a small driveway that led to a freshly plowed field. There, looking out over the field I let the tears empty themselves out and asked God to forgive me for my anger and to help me literally find my way. And the God of hope did just that. I made a right-hand turn at the next intersection and within five miles I found a gas station and a signal. As I travel the path to the 'stable and beyond' this Advent, I will strive to remember Jeremiah’s words: “I know, O Lord, that the way of man is not in himself, that it is not in man who walks to direct his steps.” May we all seek God’s directions in our Advent journey this year.